I was honored to lead a bookmaking program for families and folks of all ages on Saturday, January 12th. For families with children and adults. 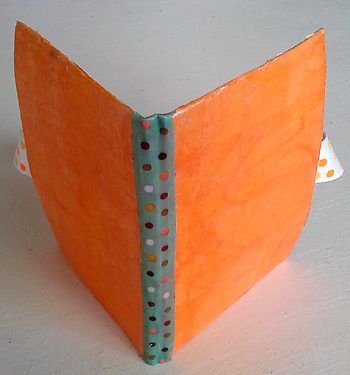 Commemorate the library’s anniversary with a memory book in this craft workshop. 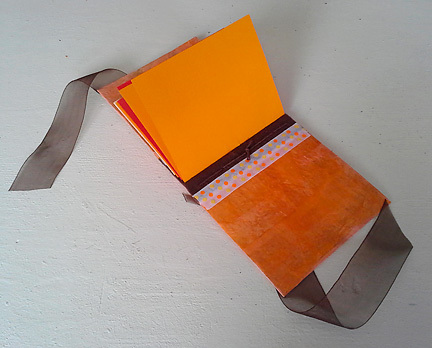 After folding their accordion spines, participants added covers and pages to create their books. we got to the fun part (well, it is ALL fun…)…what to add to our books. Colorful, glittery stickers were in abundance. so that the pages can be seen from different vantage points, and used to great effect for display. Great for a centerpiece, and to display photos on. Participants enjoyed a multitude of foam sticker letters. Has spelling ever been so fun? Here’s our line-up of stellar assistants, two library pages (yes, they are still called “pages”,) and a volunteer. It would not have been the same with out them! THANK YOU Perla, Keisha and Cassandra! More letter stickers, and a layering of color, texture and shapes creates an elegant cover. 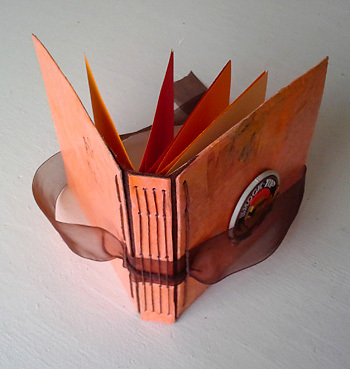 The books become sculptural when three-dimensional elements are added. Displaying an impressive creativity, use of materials, and sense of design. This one may be archived by the SMPL…it’s a keeper. A keeper of memory, celebration, and possibility. 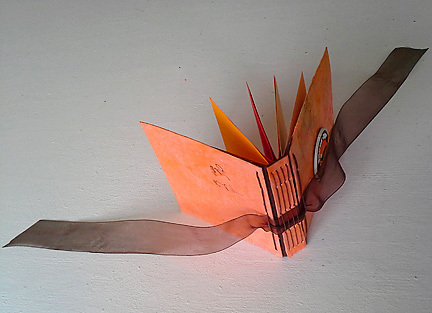 It is fascinating to explore ways of integrating ribbon and tying mechanisms into book structures. 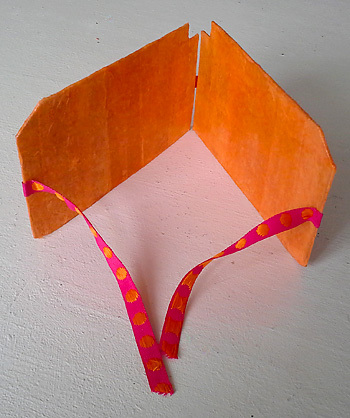 An integrated tie mechanism encourages the user to engage with the object…opening and closing, tying and untying. 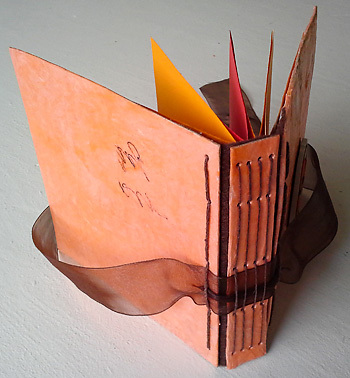 In an ongoing process of attempting to meld bookmaking, decorative painting, conceptual, and “fine” art into the mysterious form of the “artist’s book“, I am exploring the use of tissue paper and the like combined with adhesives to create a textured, tactile surface, and incorporating the ribbon or tie as an integral part of the piece. 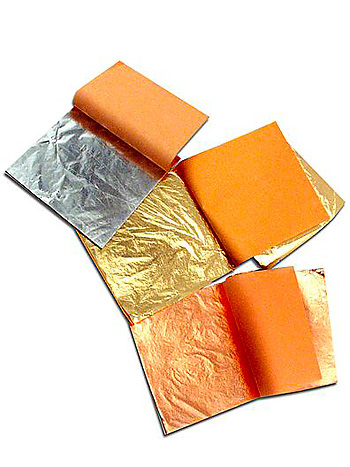 Simple cardboard is covered with crinkled tissue once used to separate sheets of metallic leaf. This tissue, for lack of a better term, is thin, fine, ultra flexible, crushable, porous, adherable and absorbent. Perfect for texturing, and when combined with adhesive, becomes almost like a glue itself. The textured surface can create a compelling, intriguing, and in some instances, incredibly satisfying object to gaze upon, to touch, to hold, and to use. 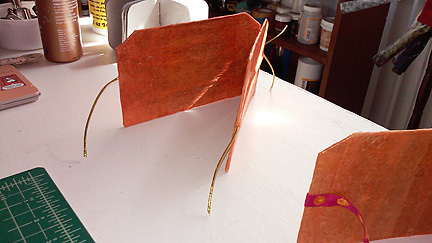 Here the actual packing of the metallic leaf become folded book pages, each one unfolded, then refolded into a signature, (technically a “section”). These signatures are then sewn together with hemp cord using the pamphlet stitch to create a “multi-signature” binding. 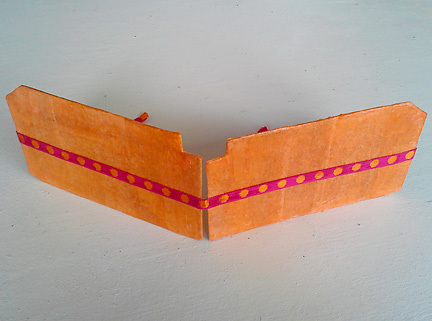 Half of the first and last pages are then glued to the inside of the front and back covers so that the pages unfold. 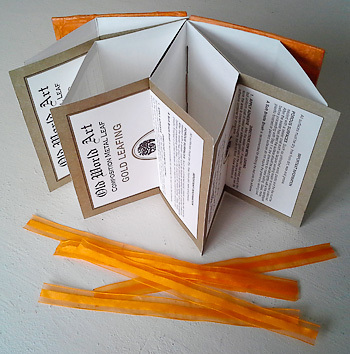 Thus each folded page opens up into four two-sided sections. 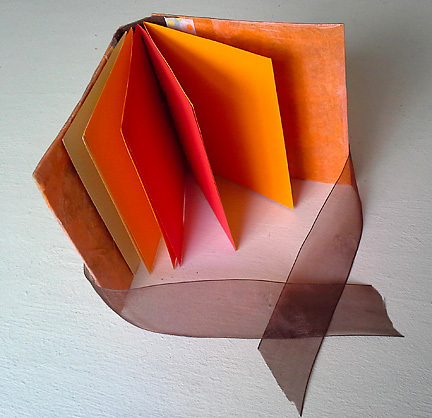 many possibilities here…both for developing the book by adding content to the pages, and for user engagement with the pages…unfolding and folding them. 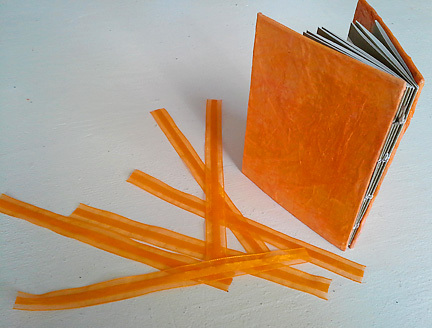 The pages can become sculptural and create different shapes. One of the magical things about the form of “the book”, is that it can be nearly flat or two-dimensional, or three-dimensional. Books are transformational…in many ways. 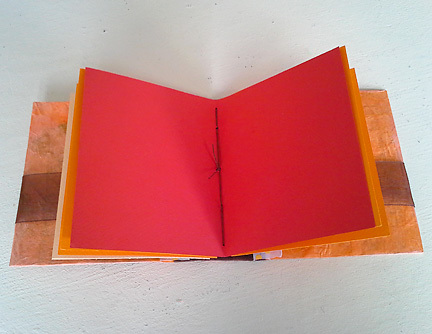 The exposed points of contact where the signatures are sewn together become the spine of the book. 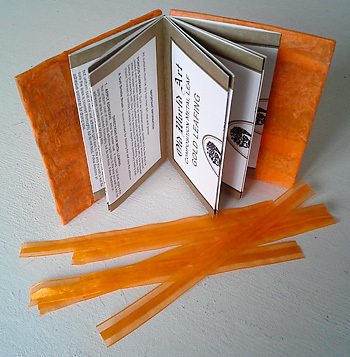 Eventually, I integrated this brilliant orange ribbon into the design of the book. it adds a bit of shimmer, dimension, and contrasting texture, and a tone-on-tone quality that I find irresistible. I will have to get some images of the finished piece. It is fun to play with, opening and closing the book, folding and unfolding the pages, seeing how many shapes can be created. The user has to engage with this book, if they don’t want to miss out! 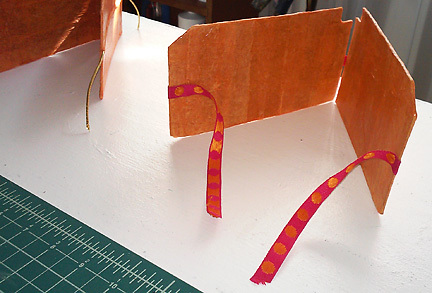 That Ribbon of…2 It is fascinating to explore ways of integrating ribbon and tying mechanisms into book structures. 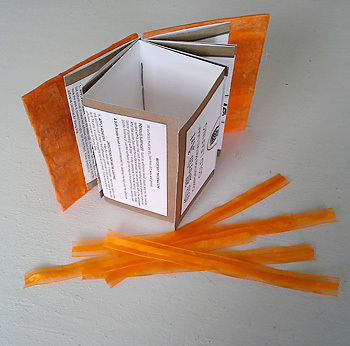 An integrated tie mechanism encourages the user to engage with the object…opening and closing, tying and untying. 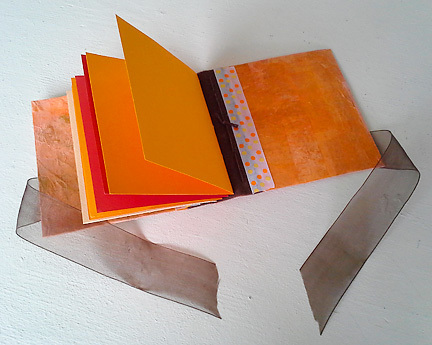 In an ongoing process of attempting to meld bookmaking, decorative painting, conceptual, and “fine” art into the mysterious form of the “artist’s book“, I am exploring the use of tissue paper and the like combined with adhesives to create a textured, tactile surface, and incorporating the ribbon or tie as an integral part of the piece. 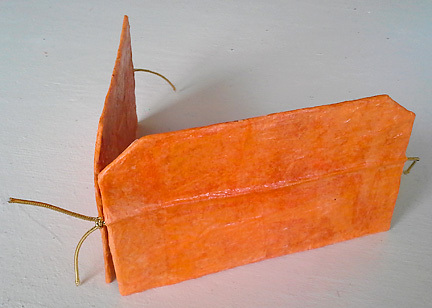 Simple cardboard is covered with crinkled tissue once used to separate sheets of metallic leaf. 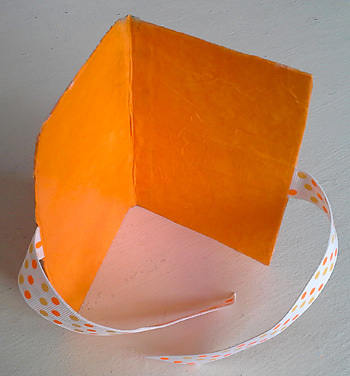 This tissue, for lack of a better term, is thin, fine, ultra flexible, crushable, porous, adherable and absorbent. Perfect for texturing, and when combined with adhesive, becomes almost like a glue itself. The textured surface combined with the ribbon or tie, can create a compelling, intriguing, and in some instances, incredibly satisfying object to gaze upon, to touch, to hold, and to use. 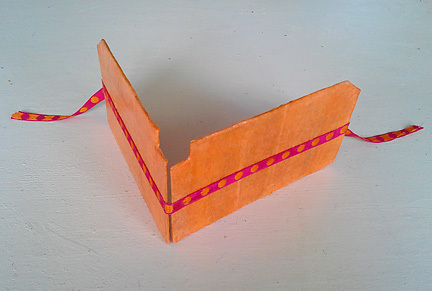 Here the brown gauze ribbon and found object sewn to the front cover complete the piece. The ribbon is slipped under the signature stitches, and one of a line of stitches keeping the strip of cloth (in this case brown felt) to which the signatures are sewn, in place. The polka-dotted ribbon adds an element of pattern and lightness and creates a striped effect when laid down next to the brown felt. 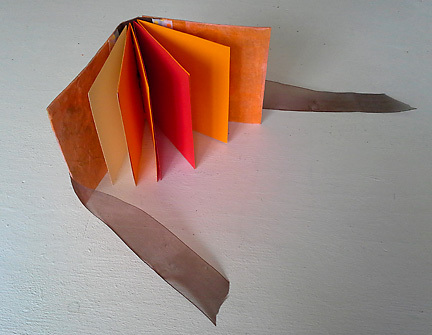 Oranges and browns are set off by the brilliant, saturated colors of the pages. or, even like a Buddha. 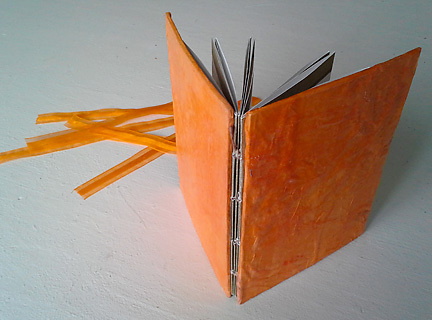 In an ongoing process of attempting to meld bookmaking, decorative painting, conceptual, and “fine” art into the mysterious form known as the “artist’s book“, I am exploring the use of tissue paper and the like combined with adhesives to create a tactile, textured surface, and incorporating the ribbon or tie as an integral part of the piece. The textured surface combined with the ribbon or tie, can create a compelling, intriguing, and , incredibly satisfying object to gaze upon, to touch, to hold, and to use. 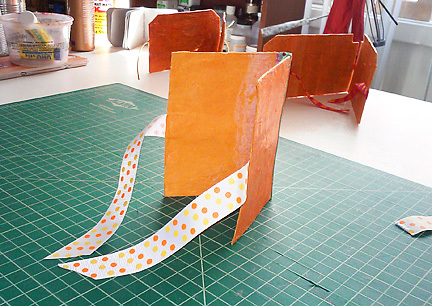 Here simple cardboard is covered with crinkled tissue once used to separate sheets of metallic leaf. This tissue, for lack of a better term, is thin, fine, ultra flexible, crushable, porous, adherable and absorbent. Perfect for texturing, which, when combined with adhesive, becomes almost like a glue itself. 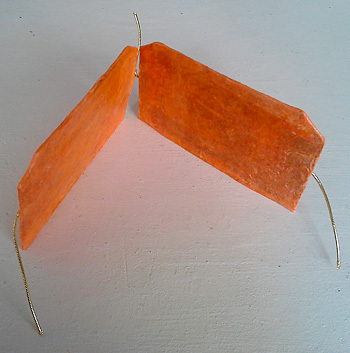 Here, one ribbon defines the spine of the structure, while another is embedded between layers of tissue and glue, with tieable ends emerging. 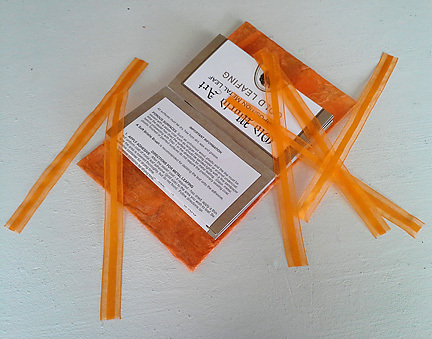 Here gold cord is sandwiched between layers of adhesive-saturated tissue, connecting the two covers and creating a built-in tying mechanism. The thin tissue takes on the shape of the cord underneath it, creating a sculptural relief or raised effect. 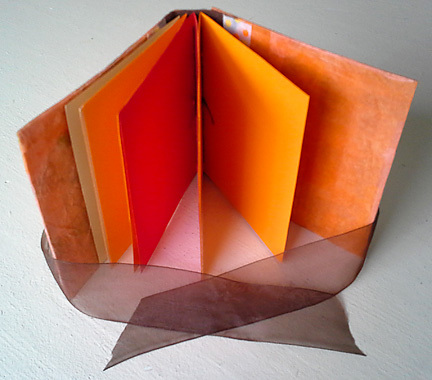 A similar technique was used for this piece, with the ribbon is adhered to the surface, creating a strong graphic element. Ends are left loose to tie the book closed. One step at a time. We have to turn each page…in turn…if we don’t want to miss the in-between. 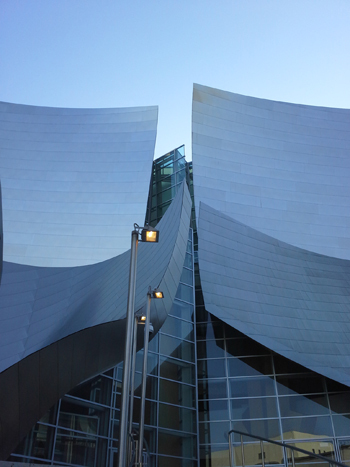 Frank O. Gehry is one of our most famous living architects. 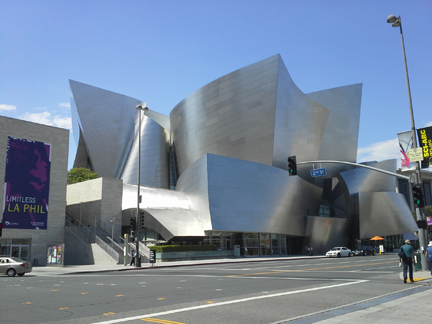 NOT to be confused with another famous Frank of architecture, Frank Lloyd Wright. 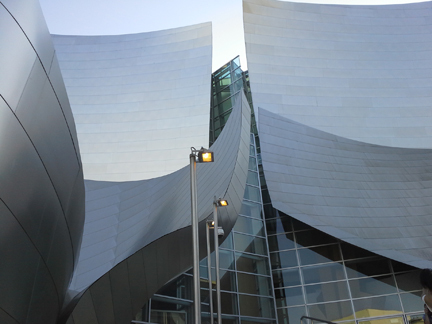 The Disney Concert Hall unfurls across a downtown LA block like a giant sculpture. 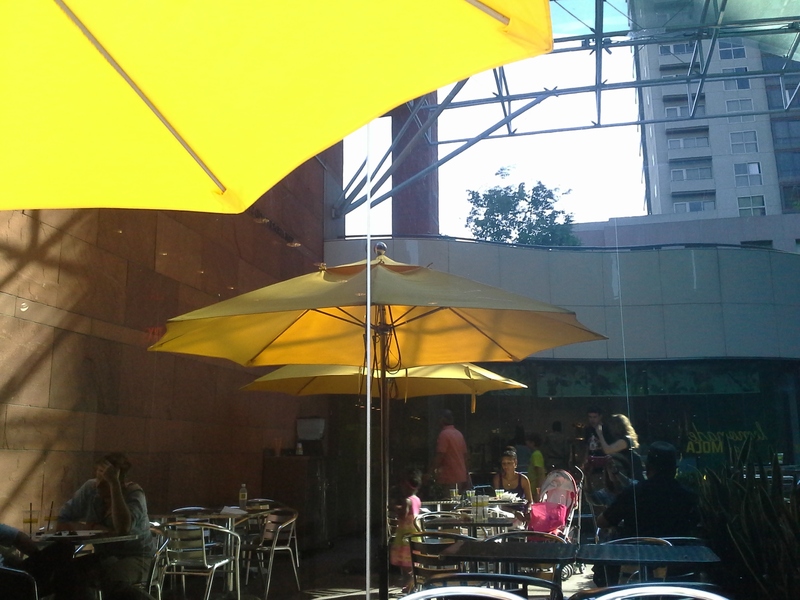 It is artfully situated down the street from MOCA, The Museum of Contemporary Art of Los Angeles. 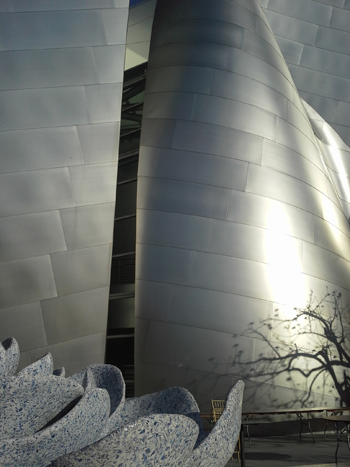 Moving around and through it’s voluptuous, curved exterior yields treasures. 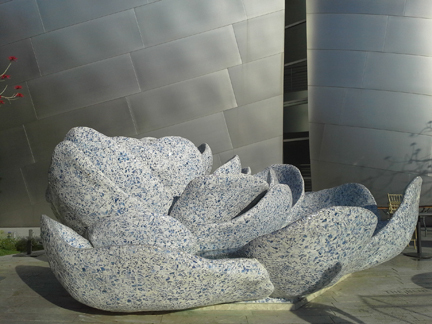 The speckled stone of the lotus-like sculpture is in stark contrast to the industrial sheen of the building’s stainless steel surfacing. Incredible to look at, the surface created some issues with reflection, heat and glare, which were resolved, in essence, with a light sand. 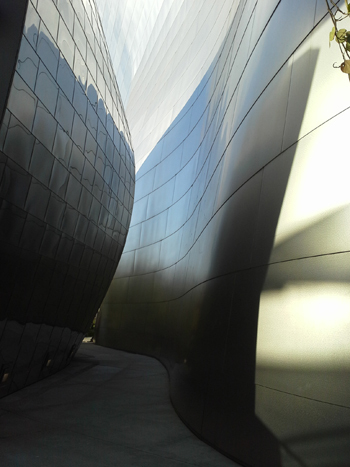 This magical magnificence is here to experience and enjoy, by All. 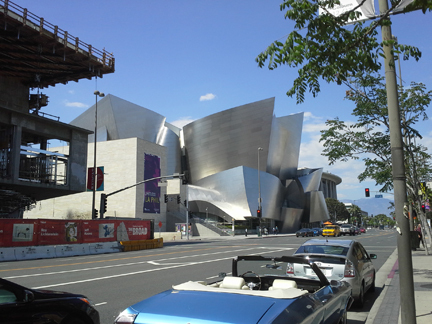 Merci a Monsieur Gehry…making of LA, an astonishing play ground.